BDW technologies was the first die-caster to mass-produce large surface structural components successfully, and has since remained the undisputed leader in this sector. 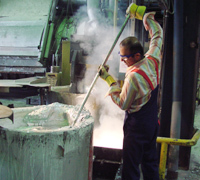 With its outstanding personnel, all experts in their specialist areas, the company’s alloy and heat treatment expertise is unique within the industry. A large number of patents bear witness to our expertise and innovative force. With experienced personnel, an open approach and a commitment to delivering on promises, BDW technologies has gained a high level of trust with customers. Our references speak for themselves. Faced with growing requirements for the mechanical properties of cast parts, a new technology arose in conjunction with AURAL® alloy development – heat treatment. Here too our research resulted in another patent, AURALTHERM®. The Power & Free heat treatment line has been specially designed for large series and is controlled and monitored by a PLC largely adapted to the process. Specifically adapted to AURALTHERM®, it ensures a high level of reliability and saves energy. The monitoring of each and every carriage guarantees permanent traceability. Downstream processes such as vibratory finishing, abrasive blasting, CNC processing and assembly complete the process chain. As a full service provider, BDW technologies can therefore reduce the cost of administration and logistics for its customers. BDW technologies * is the preferred research and development partner of its customers. * offers individual solutions and customised component features. * guarantees a consistently high level of quality. * can compete on a global scale, thanks to its medium-sized company structures and high level of automation. * provides all core processes and expertise in-house. * has a clear technological advantage over its competitors through years of experience in structural components. The aim of our certified quality management system is a zero error strategy. All our efforts are channeled into reaching this goal. Every project at BDW technologies is subject to these requirements. For us, quality is not merely the result of individual operations and controls, but rather a holistic principle – from the planning to delivery. 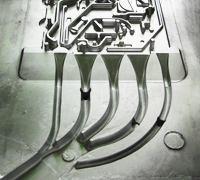 The continual improvement process is a key element in BDW technologies’ quality focus.